Create fun and fashionable island styles with Disney's Moana of Oceania! With this fashion design set, kids can decorate Moana's outfit with stencils. Fill her coconut-shaped water basin with water and dip in the water pen. Then, drag the water pen over stencils on Moana's skirt to create colorful designs and patterns! Use the water pen to reveal designs, too! When the outfit dries, the designs disappear so kids can create new looks again and again. 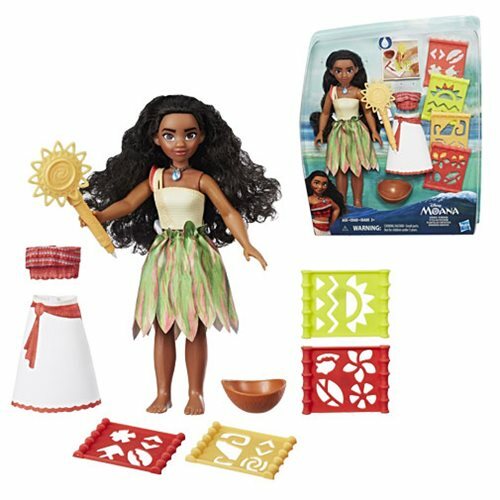 She comes with 2 skirts, including her signature outfit from the animated movie Disney's Moana. Ages 3 and up.